This post is a continuation of the main article on Dances's Square, Crescent and Circus which give an overview and sets the context of this series of posts. Posts on the neighbouring locations of America Square and The Crescent are also part of this series. Situated at the southern end of Vine Street in the City of London, the third element to Dance's plan was 'The Circus', from the Latin word "Circus" meaning a ring, oval or circle. Like the neighbouring Crescent this was the earliest planned use of curved frontages, and introduced the design concept of "circuses" to London. Built between 1767-74, at the same time as America Square and The Crescent it was thought, like the Crescent, to have been influenced by John Woods the Elder's earlier Circus in Bath, Somerset which was started in 1754, but completed in 1768. 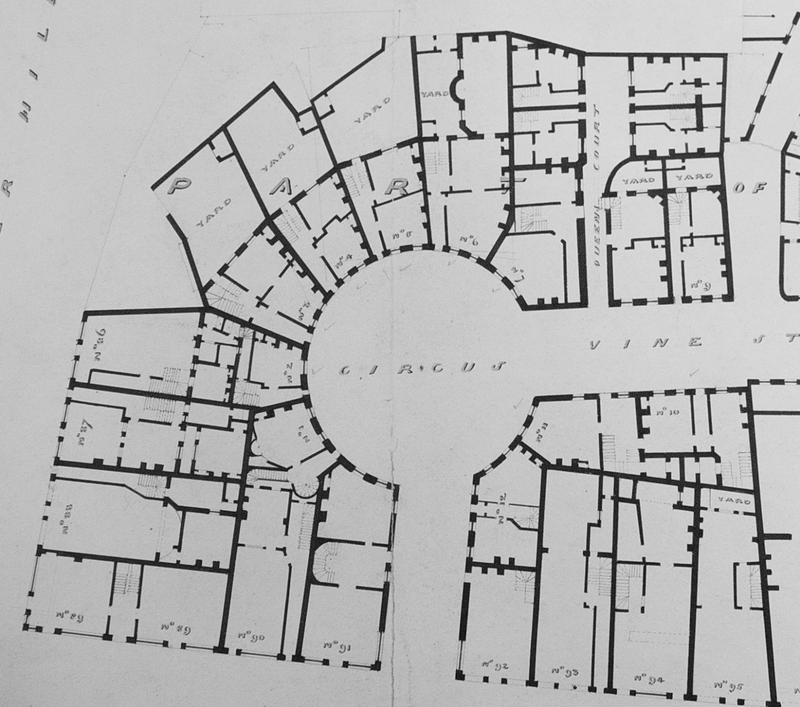 Plan of the Circus, Vine Street, from survey of properties administered by Corporation of London, 1841. The Circus was originally a cluster of ten houses arranged in a tight circle of about 18m (60 ft) in diameter, with some additional houses located close by along Vine Street and also the small link road connecting the Circus to The Minories. The houses were smaller than those in the neighbouring Crescent with most of the frontages being only 4.6m (15 ft) across. They were the same height of four storeys tall, but mostly just two bays wide. The decorative elements of the front doors were also different to those in The Crescent and America Square, with some having plainer round arched entrances, with only a couple having more decorative stone door cases similar to those in America Square. The photograph below from 1918, shows the southern most houses of the Circus, numbered 2 through 6, in a good state of repair and in mostly original condition, approximately 150 years after their construction. Dance's Circus in 1918. Photographer: Anon. Still almost completely intact at the start of the war, the Circus was all but totally destroyed following the German fire bomb attack on 29th December 1940 which laid ruin to one-sixth of the City of London that night alone. The Second Great Fire of London was name used to describe one of the most destructive air raids of London during the Blitz. In one night from 6pm on the 29th December 1940, until the early hours of the 30th, more than 24,000 high explosive bombs and 100,000 incendiary bombs were dropped on the City. The bombing started over 1,500 fires, many of which joined up to create a firestorm that destroyed an area greater than that affected by the Great Fire of London in 1666. On this night 19 of the City's churches and 31 Livery Halls were destroyed, with the largest continuous area of destruction stretching south from Islington to the edge of St Paul's churchyard. 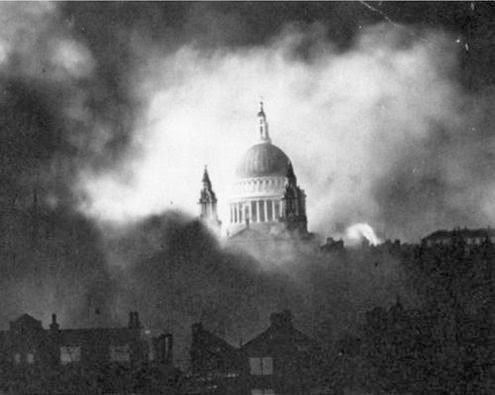 It was this night that provided one of the Blitz's most poignant images of St Paul's Cathedral rising above clouds of black smoke, as featured on the front cover of the Daily Mail newspaper for the 31st December 1940 along with caption "War's Greatest Picture: St Paul's Stands Unharmed in the Midst of the Burning City"
St Paul's Cathedral, taken from roof of Daily Mail building, by Herbert Mason. War-time policemen Arther Cross and Fred Tibbs recorded in photograph the bomb sites across the City of London throughout this period, and the London Metropolitan Archives has a large collection of their photographs, including the one shown below featuring The Circus the morning after that dreadful night. Only one of the original Georgian houses (No. 1 in the plans above), alongside a later period adjoining warehouse survived the second world war. 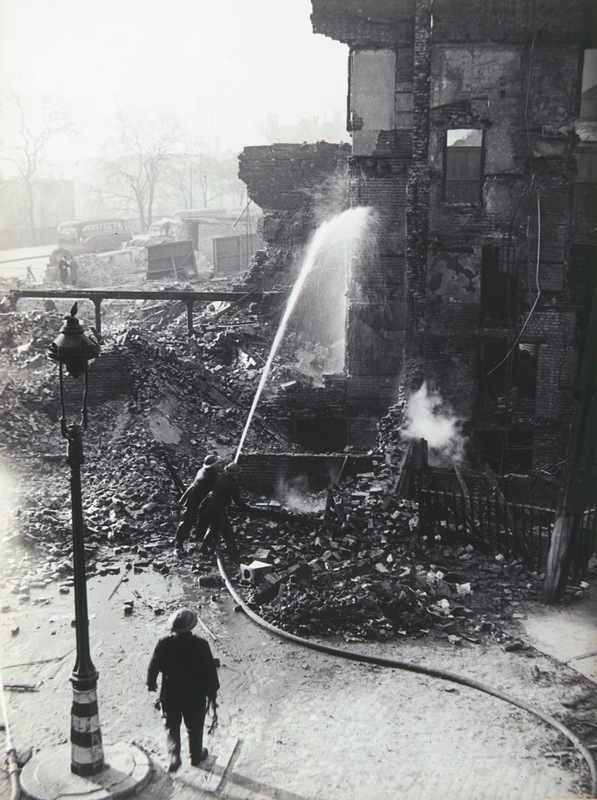 Firemen dousing the ruins of The Circus in 1940 after extensive damage from bombing. Photogapher: Arther Cross & Fred Tibbs. Reproduced by permission of London Metropolitan Archives. After the war, the lone surviving house and adjoining warehouse continued to be in commercial use. There is a photograph of the pair in 1957 showing both in good states of repair, although the house looks like it had been converted to a small warehouse due to the left most window opening having been elongated and a iron hoist fitted to the wall at the second storey level. This can be seen again in a photograph from 1973 by M.D. 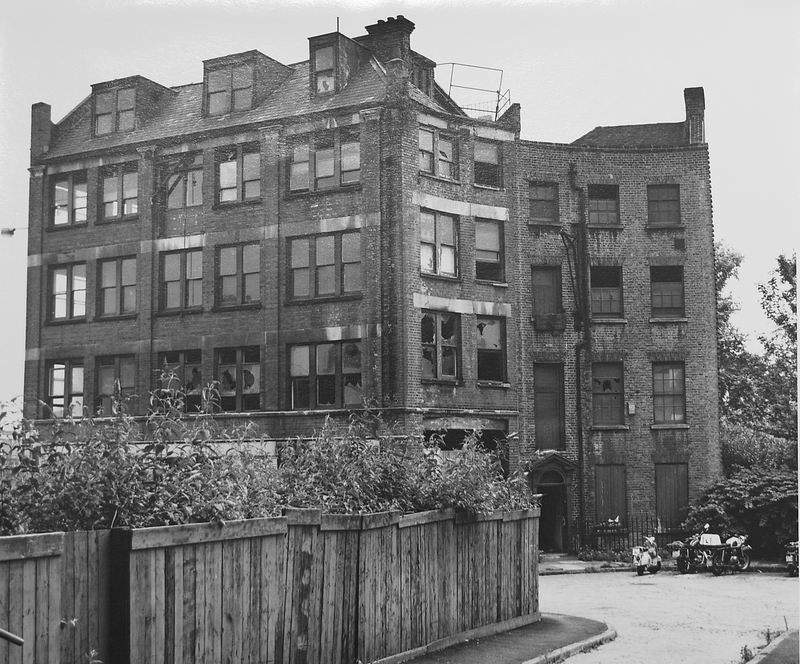 Trace, showing a rather forlorn pair of buildings with No.1 still having its original door case, and showing evidence of its earlier conversion to a warehouse. The dilapidated remains of The Circus in 1973. Photographer: M. D. Trace. Reproduced by permission of London Metropolitan Archives. The Tower Hill Improvement Trust acquired 2000 year leases on the remaining buildings in 1962, which was then sold to the Greater London Council (GLC) in 1975/6 who converted the land to open space as part of the road widening scheme at Tower Hill. 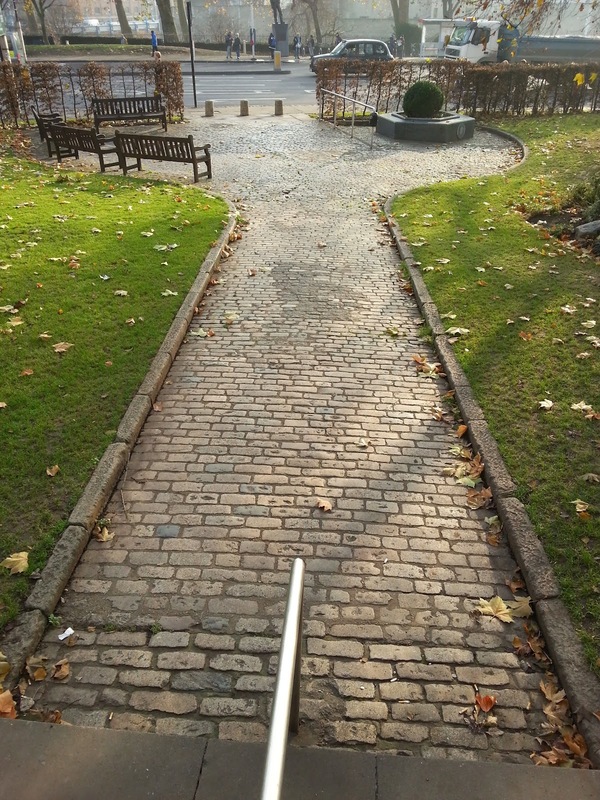 Whilst the buildings them selves were demolished, a representation of the foot print of the Circus itself in the form of the granite cobbled road was left in place as a reminder of this pioneering development. The granite block roadway of the Circus is still there today as is shown below. It sits anonymously as part of the small gardens adjacent to the busy trunk road and close to the large remains of the city wall at Trinity Place, by the entrance to Tower Hill underground station. There is no signage as to significance of what was once London's first "circus", so I am sure most people who walk past or even sit on the benches here are completely unaware of what the granite blocks represent. Looking south to the remains of George Dance the Younger's Circus at Tower Hill, London. The walkway through to The Crescent under the former London Metropolitan University building has been closed for some time, but is planned to be widened and realigned to the original path of Vine Street as part of the new hotel planned to be developed here at the time of writing. The post on The Crescent features more information about the forthcoming hotel. Fantastic post, what a wonderful insight into Hammet's Circus. I was wondering if you could please give me some information about the image you have here of the 1841 Plan of the Circus that you have - could you tell me where it comes from? It's got some great details on it!